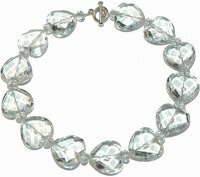 A Rock Crystal necklace. A single row of 13 large Rock Crystal heart briolettes (28mm) each interspersed with 14 round faceted Rock Crystal nuggets (10mm) attached to a silver ring and bar clasp. Length 17 inches (43cms). The Pietre d'amore necklace can be lengthened or shortened.